FtK: Oven "Fried" Chicken | Stahancyk, Kent & Hook P.C. 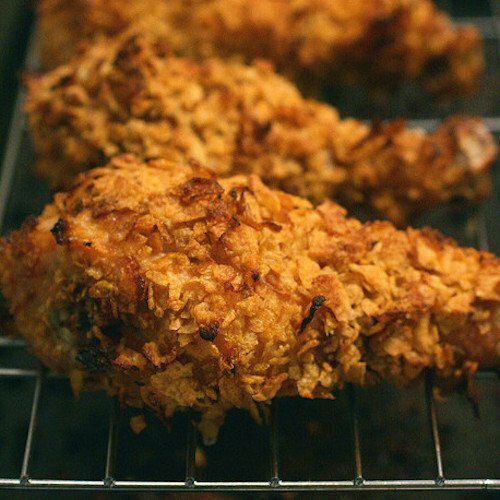 Chicken drumsticks “fried in the oven. Pre-heat your oven to 425º. In a bowl, mix flour, paprika, oregano, and a pinch each of salt and pepper. In another bowl, whisk together the eggs and milk with a pinch each of salt and pepper. In one more bowl, combine the cornflakes and bread crumbs with yet another pinch each of salt and pepper. Dredge a piece of chicken in the flour mixture, making sure to cover it completely. Shake off the excess flour and submerge it into the egg mixture. Let the excess egg drip off and place chicken in the breadcrumb mix. Be sure to coat it thoroughly and evenly. Next, place the chicken on a sheet pan drizzled with a 1/4 cup of olive oil. Align the pieces so they are not touching. This will ensure more crispiness. Drizzle the remaining 1/4 cup of olive oil evenly on the chicken and place in the oven. Cook the chicken for 20 min (check after 15 min making sure it is not getting too brown – all ovens cook differently). Turn each piece over and cook for an additional 15-20 minutes, or until golden brown and no longer pink inside.